The problem with all this is where in the valley is the actual location. 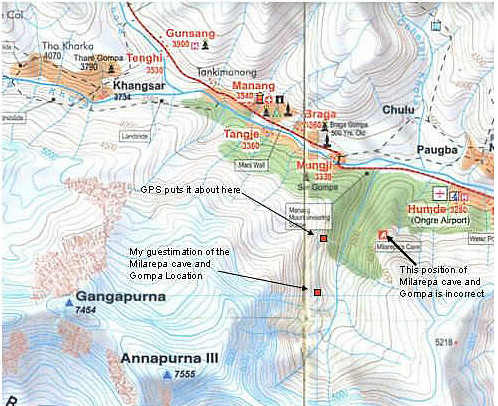 I am tempted to place it further up the valley but I don’t remember crossing any side streams and none are visible in my photos so I have to assume the Gompa is located before the streams on the map. The map doesn’t show the huge glacier in the valley either! 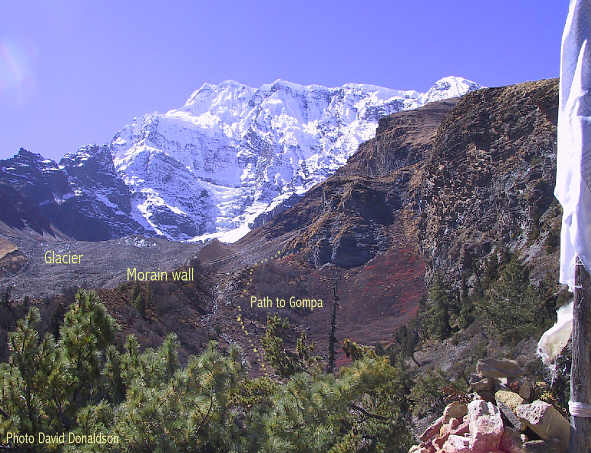 We do know the Gompa is at just over 4,000m elevation and the Nepa map also had it on the 4,000m elevation line. As best I remember we climbed for about a kilometer or more after we turned up the main valley to the Gompa. 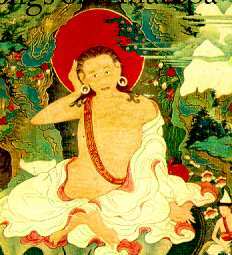 Other reports in LP etc have the Gompa at 4,000m and the caves at 4,300m but the caves pointed out to us as Milarepa’s and the one holding the bow were only 100m or so above the gompa. 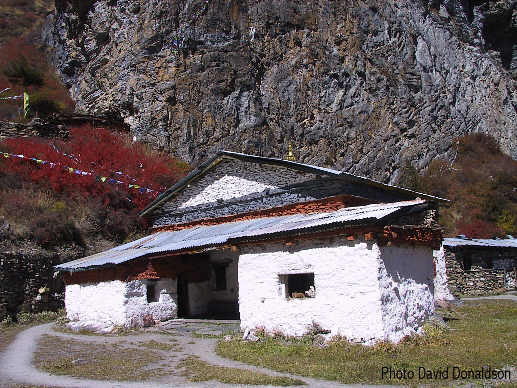 The Gompa is quite simple but elegant and surrounded by many other buildings to house pilgrims which flock there at various times of the year. Each town seems to have a different time during which they celebrate for several days at the site. There are prayer flags fastened to the cliffs behind the gompa streaming over the Gompa and they flutter in the wind above your head. Lines and lines of them all over the place. Plenty of water and plenty of flat places to camp and graze horses. According to an inn keeper in Bragga the gompa was built about 40 years ago by an old respected monk who passed away several years ago. The townsfolk then asked a young monk from Tibet who was studying with him to remain there and look after the gompa. Hard to tell his age but possibly early 40’s. There are power lines running to the area from Hongde. The people bring food and money to the monk who seems to do quite well out of the whole deal. During the winter the monk retires to a house lower down the valley. While we were there a party of townsfolk from Pisang came galloping up on about 10 horses and unloaded bags of food at the gompa. The monk will feed you quite happily! He speaks some English but you have to listen quite carefully to follow what he is saying. He mentioned that many monks come there to meditate but most can not stand the seclusion and loneliness and soon return to their comfortable gompas in the valley below. The caves are located in the cliffs above and to the right of the gompa. 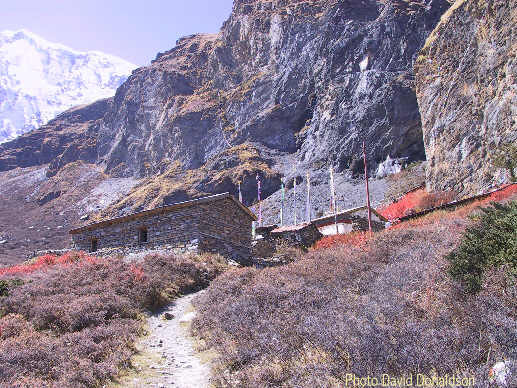 It is said the original cave with the year round spring has been covered up by a rock slide but there are still several others to visit one of which contains a bow to commemorate the story of a hunter who came across Milarepa and was so impressed by the saint he became a disciple. It would be a great place to camp and spend a couple of days exploring and getting aclimatized. 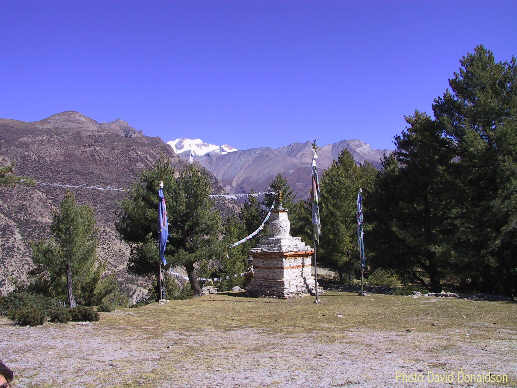 The Gompa is sheltered from the cold prevailing winds and catches the sun due to it’s southerly aspect, but venture a few hundred meters further up the moraine to the glacier proper and it can be bitterly cold. This is a very peaceful and beautiful place and it felt good to be there. The most difficult part is the beginning! From Bragga head down the track towards Honde about 500m and you will see a sign to Milarepa’s cave. Cross the bridge and head across the pasture angling slightly left rather than right as the trail is better. There are many paths so pick the best one as it can get quite wet underfoot. As you get close to the forrested hill you should see a track heading up on your left. It has been cut into the hillside through the pine forrest and follows a good gradient although up and up the whole time. You will pass through various clearings and flat spots with chortens, deserted dwellings and grassy pastures. The path angles left the whole time contouring around the hill in and out of several large gullies until rounding the large valley which contains the gompa. 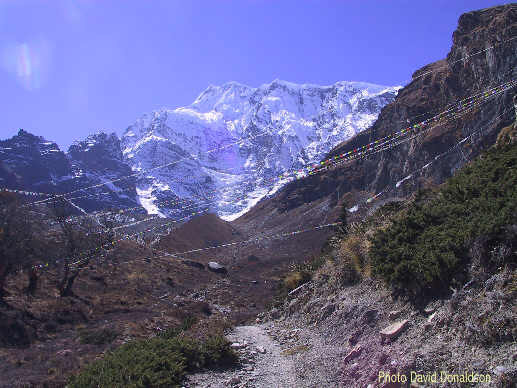 You can see the prayer flags in the distance festooned everywhere. 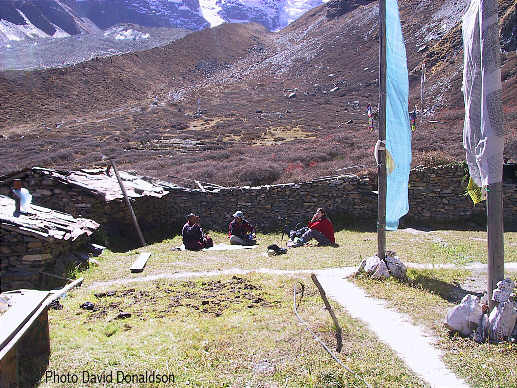 Head up this valley through a patch of beech trees and the gompa is tucked in a grassy clearing against the cliff. Journey takes a couple of hours if you keep going but it is tempting to laze around in some of the spots en route. As I remember there is no water until the gompa. The gullies were dry.